His way is our peace – I Am Not Ashamed Of The Gospel Of Christ! This is dedicated to one who is known as The Traveller,a dear one in the body of Christ who along with many brethren know what it is to suffer for Christ’s sake yet stays close to the one who has been called to a harvest where the labourers are few. 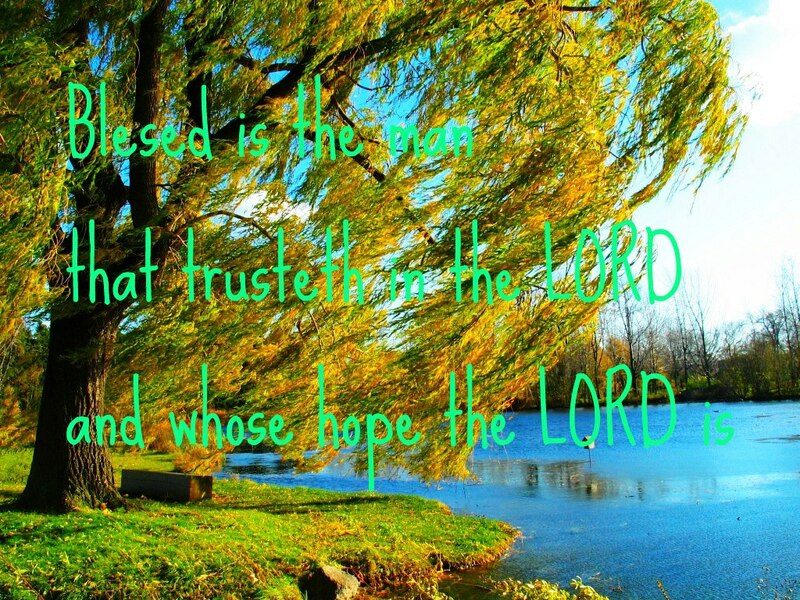 Nothing grows more beautiful than a tree planted by a river,as it is supplied with sufficient water to bear fruit in due season.We too are as a tree that has been planted by the hand of God to show forth His glory in the earth.When we have put full trust (faith) in God and not in the flesh we are blessed beyond belief! (Jeremiah 17:5-10), 5 Thus saith the Lord; Cursed be the man that trusteth in man, and maketh flesh his arm, and whose heart departeth from the Lord.6 For he shall be like the heath in the desert, and shall not see when good cometh; but shall inhabit the parched places in the wilderness, in a salt land and not inhabited.7 Blessed is the man that trusteth in the Lord, and whose hope the Lord is.8 For he shall be as a tree planted by the waters, and that spreadeth out her roots by the river, and shall not see when heat cometh, but her leaf shall be green; and shall not be careful in the year of drought, neither shall cease from yielding fruit.9 The heart is deceitful above all things, and desperately wicked: who can know it?10 I the Lord search the heart, I try the reins, even to give every man according to his ways, and according to the fruit of his doings. (Psalm 1:1-3). We can find peace when we read the story of when the disciples were in the boat on the sea as the waters began to rage,yet there was Jesus laying asleep and undisturbed.The disciples were so upset with their surroundings as Jesus asked them why they were fearful and had such little faith?We learn of the power of our Saviour in the midst of chaos as He is our peace in the midst of the storms of this life! (Matthew 8:23-27). 23 And when he was entered into a ship, his disciples followed him.24 And, behold, there arose a great tempest in the sea, insomuch that the ship was covered with the waves: but he was asleep.25 And his disciples came to him, and awoke him, saying, Lord, save us: we perish.26 And he saith unto them, Why are ye fearful, O ye of little faith? Then he arose, and rebuked the winds and the sea; and there was a great calm.27 But the men marvelled, saying, What manner of man is this, that even the winds and the sea obey him! James 3:17-1817 But the wisdom that is from above is first pure, then peaceable, gentle, and easy to be intreated, full of mercy and good fruits, without partiality, and without hypocrisy.18 And the fruit of righteousness is sown in peace of them that make peace.